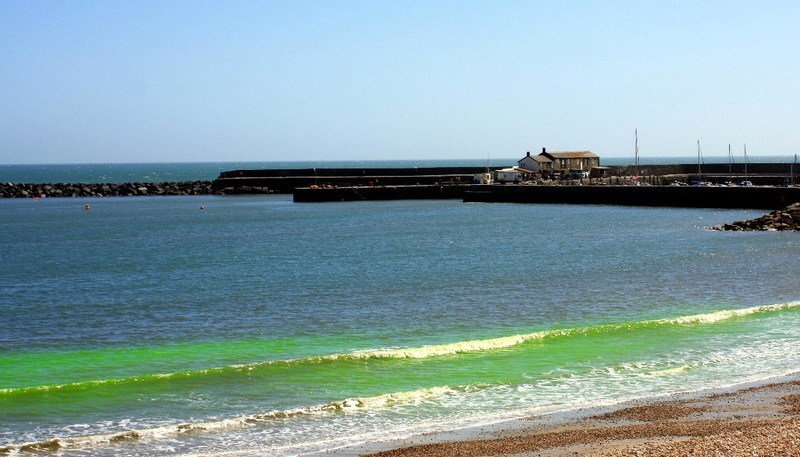 Residents of Lyme Regis in Dorset were startled recently when the sea took on a distinctly red colour, as shown in the photograph above. Some locals feared the end of the world or a biblical plague, while other theories ranged from a butchered whale to a bloom of algae. The mystery was cleared up when it was discovered the authorities were using coloured dye to test the drainage system! This became particularly apparent when they switched from red dye to a rather fetching shade of green, as illustrated below. 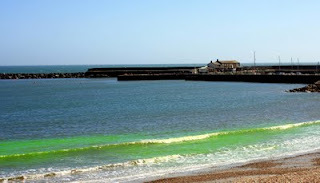 The photographs were taken by Chris Andrew, who is Education Officer at Lyme Regis Museum... many thanks to Chris for permission to use the pictures on this blog. Between you and me, I suspect Chris was also the imaginative "local" behind at least some of the theories mentioned above!